Though botanically zucchini is a fruit, it’s considered a vegetable — more specifically, a squash. Both raw and cooked, zucchini offers notable health benefits. As a garden vegetable, it’s easy to grow. Widely available in markets of all kinds, it’s usually inexpensive. And as a kitchen staple, it’s quite versatile, as you’ll see from our Tasty and Abundant Zucchini Recipes page. Zucchini belongs to the species Cucurbita pepo which includes pumpkins and cucumbers. It is also known as courgette in French while the British call it vegetable marrow. The skin color can vary from light to dark green. It is best eaten prior to the skin becoming tough and seeds growing large. 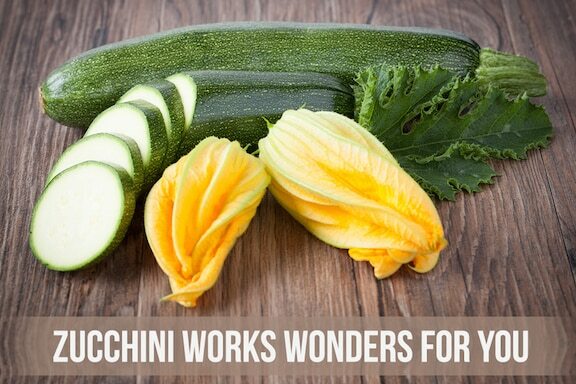 The flowers of the zucchini are also edible and used regularly in French and Italian cuisine for dressing meals or for garnishing cooked fruit, offering great taste in the process. Zucchini is extensively grown in Argentina, Mexico, Turkey, Egypt China, Japan, Italy, and India amongst other countries. Though grown all year long, the peak season is in the summer months. Zucchini cannot be stored for long periods unless frozen (you can freeze grated raw zucchini, or lightly steamed slices. Make sure to pack in air-tight containers). Zucchini Is Awesome For The Heart: Zucchini contains good amounts of potassium that helps reduce blood pressure. It also contains moderate levels of folate that breaks down amino acids like homocysteine that cause heart attacks and strokes. The considerable amount of magnesium helps in keeping blood pressure at a normal rate and the heart beat at a steady rhythm. Zucchini Helps In Weight Loss: Zucchini has incredibly low calories that make it a much-preferred part of any weight loss diet. Substituting calorie rich foods with a sizable portion of zucchini helps you in reducing the number of calories that are taken in. This makes it easier to burn off calories, thereby helping you lose weight. The fibre content helps in burning the fat in the body. Zucchini also keeps the body hydrated with its 95 percent water content. This gives you more energy and fewer headaches. Zucchini Improves Eye Health: The cousin vegetable, cucumber is beneficial for reducing the puffiness in the eyes. Similarly, zucchini when used externally helps to remove the puffy bags that develop around the eyes due to excessive water retention. The swelling around the eyes lessens due to the water-rich content. The carotenoid Beta-carotene can be converted into vitamin A in the body. The presence of Vitamin A in the squash helps in active cell development in the eyes, which enhances vision and helps in preventing age-related medical conditions affecting the eyes such as macular degeneration. 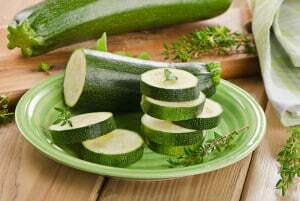 Zucchini Guards Against Asthma and Strengthens Teeth And Bones: Due to Zucchini being a good source of vitamin C, it is considered a good food for fighting asthma. Vitamin C, a powerful anti-oxidant, plays a huge role in keeping the immune systems healthy and fighting respiratory problems. The anti-inflammatory properties help keep the lungs open and clear. Zucchini also contains calcium that helps the nervous system to function properly and gives strength to the bones and teeth. Zucchini Helps Lower Cholesterol: The high-fiber content in zucchini helps in lowering cholesterol. The high levels of vitamin A and Vitamin C delays the beginning of atherosclerosis by keeping the cholesterol from oxidizing the body’s blood vessels. Zucchini rids the body of excess toxins. The benefits of zucchini are immense and not limited to just these. This versatile summer squash is also healthy for the skin giving it a glow and restoring its moisture. 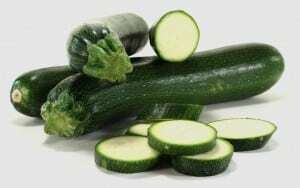 Recent studies indicate that zucchini assists in reducing symptoms of prostatic hypertrophy (BOH) or a condition in which there is an enlargement of the prostate gland. Complications with urination and sexual functioning can thus be checked. The anti-inflammatory properties can play a significant role in the protection against diabetes. Begin savoring this wonder-working vegetable as a regular part of your food habits! Vineetha Reddy is very passionate about nutrition, fitness, health & wellness. She strongly believes that the ingredients you find in your pantry are the best medicines that you can get. Follow her on Facebook and Twitter. Great information. I have become a regular user of zucchini. Which are the main stores that sell this super vegetable? Thanks a lot for such information. I had cream of zucchini soup today and it was delicious. Kitchen required maintenance so I went to a nearby restaurant in a big hotel for lunch, where I had this delicious vegetable soup. I recently lost weight, (31lbs. )after I completeing my diet, I began to crave zucchin, so I decided to make it part of my daily regime (my veggie choice for lunch or dinner), even though I’m no longer dieting, I have continued to loose weight (1.5 per week) just by eating this delicious veggie!!! I sauté it on the stovetop with a little olive oil, garlic & onion power, and Bon appétit! At 52 years old I feel Amazing & my skin never looked better! Great. I have eaten zucchini for a month a have shed 15 pounds. Glad am eating much of it in place of fried stuff. I feel lighter in body and shape. We call them courgettes in the UK, never heard of a vegetable marrow.